SSNautical.com is your online source for personalized life rings, marine signs, channel markers, regulatory buoys, and boating apparel. We are located in South Eastern Michigan - on the Southern end of the Detroit River. SS Graphics, Inc., owns and operates SSNautical.com. We have been selling marine and boating products online since 2001. SS Graphics, Inc. manufactures and distributes a wide variety of marine signage and sign related products. 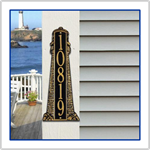 We offer a complete line handicap and parking signs in addition to our address plaques and weathervanes. For a complete listing of the sign products we sell please visit our full line sign company at SignOufitters.com. Did you know that SS Graphics, Inc. is an Authorized U.S Government Vendor?